High Probability Trade: Are LEH and WM headed for Zero? 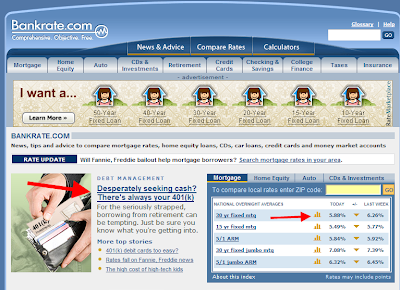 Mortgage rates have spiked lower dramatically. How low will mortgage rates go? When the 2yr treasury note is yielding 1%, maybe we'll be closer to the bottom. ZB is grinding higher, yields continue lower, and more financial stocks like LEH and WM go lower. You have to question the drop in yields in conjunction with the weakness in these stocks. Is the price action suggesting one or both of these stocks will go under. And if these companies go under what effect will this have on US treasuries. Definetily a spike lower will occur just like we saw with the Bear sterns bailout. The question is, if and when will it happen. What are blogs saying about FRE, FNM, LEH, and WM? Lehman just wrote down commercial real estate to .39 on the dollar - that's what i heard. What that means is, since these idiots always water at the same hole, all the rest will have huge write downs coming. They're all going lower without, at least for the time being, not having to worry about the Govt bailing them out. I just see Lehman as desparate it's like the fat sweaty girl with glasses at the dance. She's desparate to dance, but it just aint' happenin'. Lots of other ugly girls aren't sweating yet. Farther to fall. And they are all going to fall.